Dynamic Quality of Service™ is a SmartShare patented technology which is integrated into all SmartShare Systems products. This technology analyzes traffic patterns and automatically prioritizes time-sensitive traffic such as IP telephony, video conferencing and thin clients, so that they operate flawlessly and without delays. The traffic analysis takes place continuously, and the prioritization and allocation of extra bandwidth happens in a fraction of a second. No technical insight is needed to use Dynamic Quality of Service. As the technology is an integral part of the bandwidth optimization function, there is no need for configuration or manual allocation of bandwidth for connections. Today’s business networks serve multiple mission-critical real-time applications. More and more companies are adopting Unified Communications solutions and equally many are using these as hosted services, also called Software as a Service (SaaS) or Cloud Computing. When utilizing these kinds of services, the internet connection often becomes the primary point of problems. Unified Communications services such as VoIP (IP-Telephony) and video conferences require a certain, but not too high, amount of constant bandwidth but more importantly, a low latency connection to deliver good quality for the users. Many people incorrectly think that high bandwidth, more Mbit, is the solution to overcome poor VoIP conversation quality, but predictable and low latency connectivity is actually much more important. Traditional QoS solutions require manual setup and are based on a need to reserve bandwidth against expected use. This creates a number of disadvantages, of which the most obvious is that reserved bandwidth is wasted when not in use. Secondly, reserved bandwidth has a fixed size limit and can, if exceeded completely, results in a degradation of VoIP conversation. Thirdly, traditional QoS requires that all equipment end-to-end has been configured identically using the same QoS scheme (DSCP tags) and that the internet service provider (ISP) uses the QoS configuration to allocate priority in the ISP core. Getting QoS from the ISP is usually a very costly service and will then only guarantee QoS within the ISP core. If the hosted service provider used by the company is located outside the ISP core, the QoS tags are not preserved and paid QoS will provide no effect whatsoever. SmartShare’s Dynamic QoS technology has none of these disadvantages. It processes all voice, video and data traffic dynamically on the basis of current needs, optimizing internet connection utilization without the need to reserve bandwidth that may never be used. Secondly, it is independent of the QoS schemes provided by the ISP. This way, you can save internet costs while guaranteeing service quality. In order to quantify our claims, SmartShare has conducted two different benchmark tests, both using a 2Mbit/512kbit ADSL business grade internet connection. The first setup has two PC’s connected to the ISP provided router (in this test a ZyXEL). The first PC runs BitTorrent on Windows Vista, downloading various ISO Linux images and in so doing, will congest the internet connection. The second PC runs SmartShare SmartAlyzer™ which sends PING packets to Google.com and measures packet loss, round trip time and jitter. Initially we measured a packet loss rate above 20%, round trip time averaging around 1 second and jitter around 100ms. We then inserted SmartShare StraightShaper™ into the LAN side of the ZyXEL router (from the graphs at around 12:18) and results improved immediately. The packet loss went down to 0.1%, round trip time averaged 75ms and jitter went as low as 8ms. In another benchmark, we tested the effects on VoIP traffic when the internet connection was congested. We used the same internet connection, but this time we added a VoIP phone connected to a hosted VoIP PBX on the internet. We initially used a Cisco router which had been configured with its QoS parameters to prioritize VoIP traffic, and this time, benchmarked it against SmartShare FairRouter™. In this benchmark, we wanted to measure only the actual quality of the VoIP traffic and hence only logged data for the communication between the VoIP phone and the VoIP PBX. The results showed that the Cisco router delivered a packet loss of 5.34% on the VoIP communication compared to SmartShare FairRouter’s 0.0% loss. 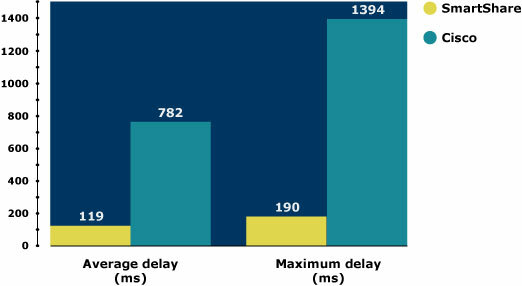 The average packet delay was for the Cisco was 782ms versus SmartShare’s 119ms, and the maximum delay was 1394ms for Cisco and 190ms for SmartShare. Both Cisco and Intel have released papers stating that the default G.729 and G.711 codecs both require a packet loss far less than 1% to avoid audible errors. 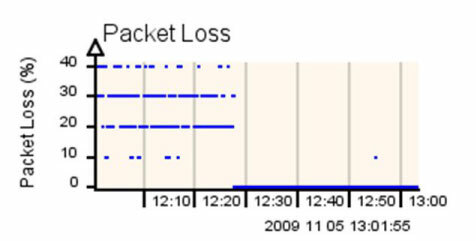 According to the well known MOS score, a packet loss below 1% provides good quality and packet loss of 5% will provide fair to poor VoIP quality. : Cisco: Quality of Service for Voice over IP. : Intel: Overcoming Barriers to High-Quality Voice over IP Deployments.